Rather than taking the time to reflect on our dearly departed year of 2012, we’ll jump right to the hype of 2013. This year is gonna be HYPE! It’s Gonna be JAMMIN!!! 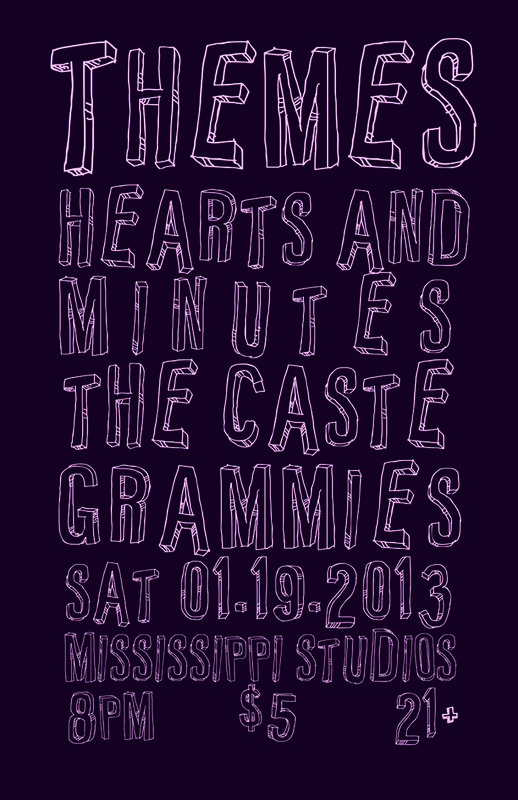 We’re going to start it off right, with a show in Portland, OR @ Mississippi Studios on 01-19-13, wherein, we will be performing our entire new album with an entirely new lineup of musicians! I won’t mention who they are just yet, but i will tell you that we are huge fans of theirs and we’re both honored and stoked to be working together. Don’t miss this show. It is a sign and it is only the beginning of the BIG things we have to come this year. I will tell you more about all of that in due time. we may even make a few announcements at the show. There’s only one way to find out. Come Join us. If these things are not enough to peak your interest, just look at this line up of bands! They’re all amazing! Listen to them as much as possible. thanks for dropping by. HERE’S A LINK TO A FACEBOOK EVENT, if you’re into that sort of thing.